Besides being famous for its tea plantation, the cool climate and the various culinary choices around Puncak make it one of little places in Indonesia try Paragliding. Puncak, which translated means Peak, is located in the Bogor-Cianjur-Sukabumi regencies, West Java, Indonesia. Just like Bogor, this area is also a top option for locals living in Jakarta looking for a quick weekend break. Puncak Gantole in Puncak is the place to go if you’re going to try paragliding. It is located not so far away from the famous mosque in Puncak, At Ta’awun Mosque. You do not need to book ahead for this activity, you just need to pop in to Puncak Gantole and register to do it (or you can contact David +6281288528755, a senior figures in Indonesian paragliding). However, there is a weight limit, I think 85 or 90 kg is the maximum. The cost of paragliding is around US $30 per person for 10-20 minutes flying time. Though it is a short time, the experience is totally worth it. There are no skills required for paragliding since you’ll fly together with the ‘pilot’. It’s a case of two people one parachute, or “tandem”. The most frightening yet exciting part in my opinion is when you are about to take off. The sensation of running on the runway and literarily needing to believe that you will fly at the end (since the end of the runway is a short cliff overlooking a tea plantation) is priceless. 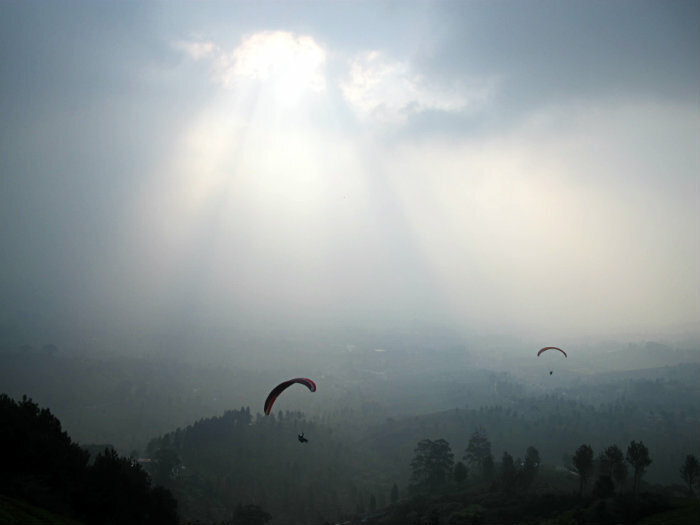 Paragliding in Puncak is only possible when conditions allow. This means not too foggy and definitely not windy. You will love the amazing view from the top. The vista of the massive tea plantations and rolling hills is amazing. If you are a big fan of a bird’s eye view then you will definitely love this activity. The breeze against your skin and the sensation of flying is just exhilarating. You will get excited, relaxed and feel happy all at the same time. By the way, you should use sport shoes (running/keds/etc), and cover yourself with long sleeve clothes since it will be a little bit cold once you are up in the air. Paragliding is completely safe, because you will have a professional guide to fly with you. The only thing that you have to worry about is the addiction of Paragliding that might suddenly infect as soon as you take off. previous post Bogor: The Botanical Garden or a Culinary Adventure! Wow, Paragliding is one of my favorite which i want to do ever in different cities and countries. So that, i can fly like a bird and see the view of that city. Thanks for sharing and write about nice blog about PUNCAK.